Measures solar radiation and is required (along with an anemometer and a temperature/humidity sensor) if you wish to monitor evapotranspiration. 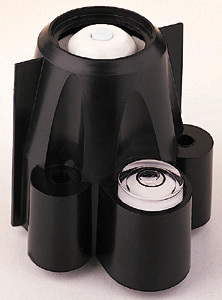 Diffuser element and housing are carefully designed for accurate cosine response. Silicon photo diode provides good match to solar spectrum. Two-piece housing minimizes radiation heating, allows convection cooling of the sensor, and prevents the trapping of water or dust. Includes built-in level and 3' (0.9 m) cable.